Perry County Ohio Bd. of Developmental Disabilities in conjunction with Perry Behavioral Health Choices, Perry County Ohio District Library, and Hopewell Health Center, is holding a seminar on the PLAY Project on Tuesday, July 24, 2018 from 6:00 p.m. - 7:30 p.m. at the Perry Behavioral Health Choices Activity Center - New Lexington, OH. All parents will be supported in developing a joyous relationship with their children with autism spectrum disorders in a way that will help each child reach his/her full potential. 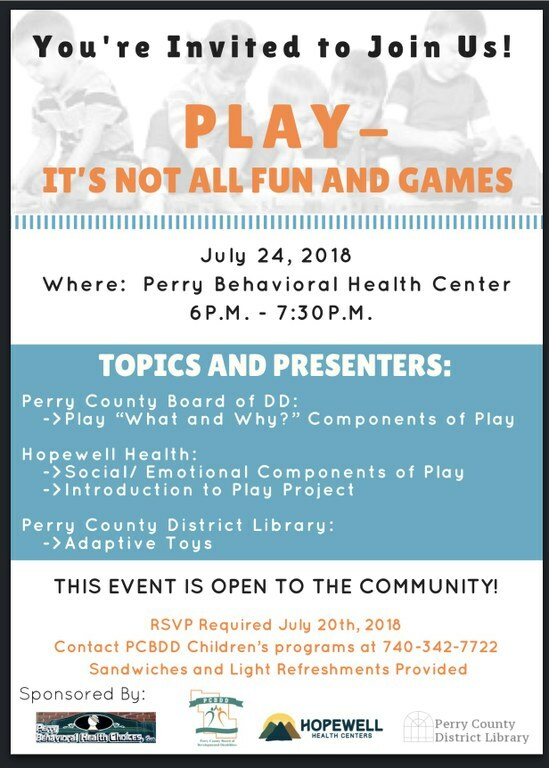 Click HERE for more information on the PLAY Project.